In Metro Manila while in a restaurant, I seldom order sea shells like scallops if not for a special occasion or a celebration. Simply because those are expensive while special occasions are once in a blue moon for me. Empty shell decor inside Little Quiapo Restaurant in Quezon City. I am already contented with what I see inside a restaurant that decorates its walls, corners or façade with sea shells. I like the interior design of Little Quiapo restaurant in Quezon City. Inside the restaurant is homey atmosphere. The restaurant is not so huge but a lot of people go there for lunch because of affordable food. It is said that Little Quiapo has established its name since 1949. Little Quiapo Restaurant, since 1949. 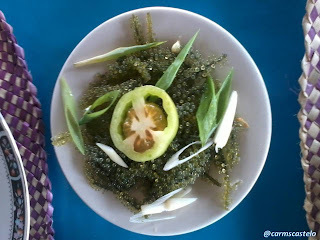 When I visited Lapu Lapu City, I was stunned by the sea foods there. The sea foods that I almost feared to eat in Metro Manila for being afraid of escalating bills are abundant in Lapu Lapu City. The empty sea shell which I pictured as decoration in Little Quiapo can be eaten and is called “saang” by locals. I told myself, “this is it!” And it was not just true but more than true to be full. Little Quiapo restaurant is located at 90 Malakas Street, Pinyahan Quezon City.